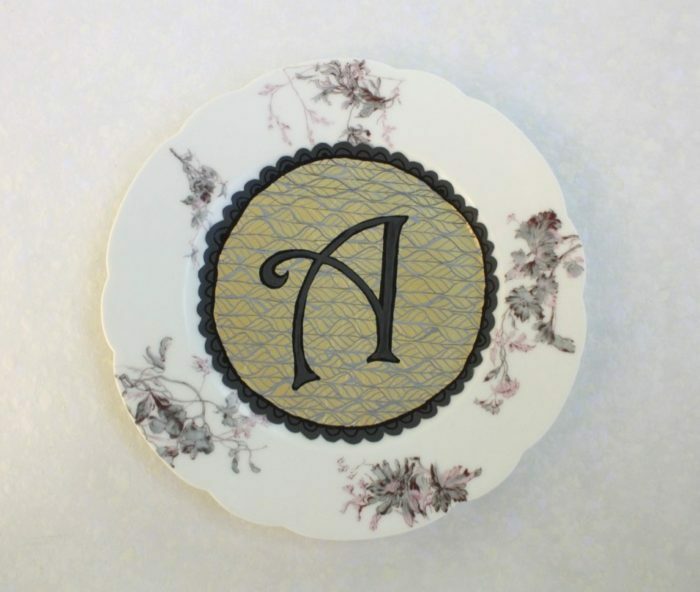 Originally I created my monogram plates by painting patterns and then applying decals I designed on my computer. The need for the typography to be perfect comes from decades in a career as a graphic designer. This contradicts my desire to bring my pieces back to their human made origins. With hand brushed strokes, the monograms take on a personality of their own. The porcelain perfect surface contrasts with the unconfined stems, swashes, and strokes. The experience is much more pleasurable and I think the finished plates reflect the joy poured into them. The closeup of this plate reveals the textural coloring of the “A.” I intentionally thicken and thin the leaf design lines to make the pattern less pedantic. I also love the contrast of matte gray bouncing across the shiny gold background. I like to include patterns within the letter forms too. 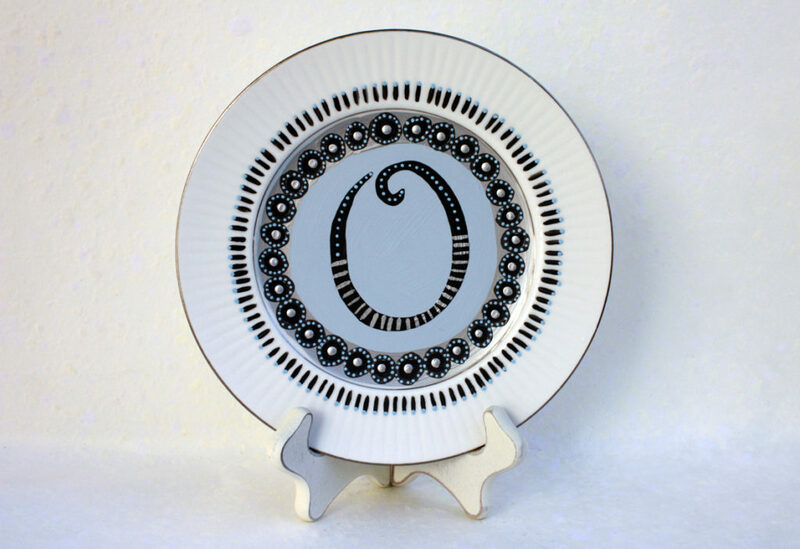 This swirly “O” repeats the dots and lines that decorate the outer edge of the plate. The original plate was basic and plain. 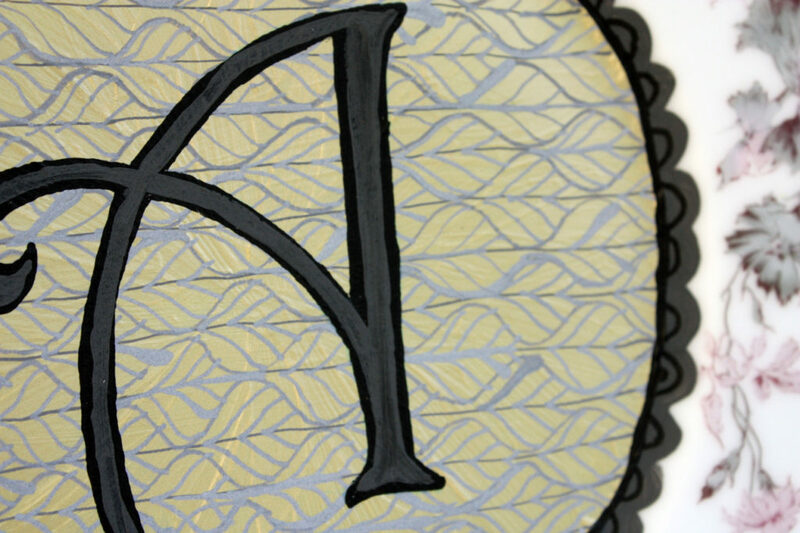 A great “canvas” for dancing circles and lace-like borders on this “R” monogram. 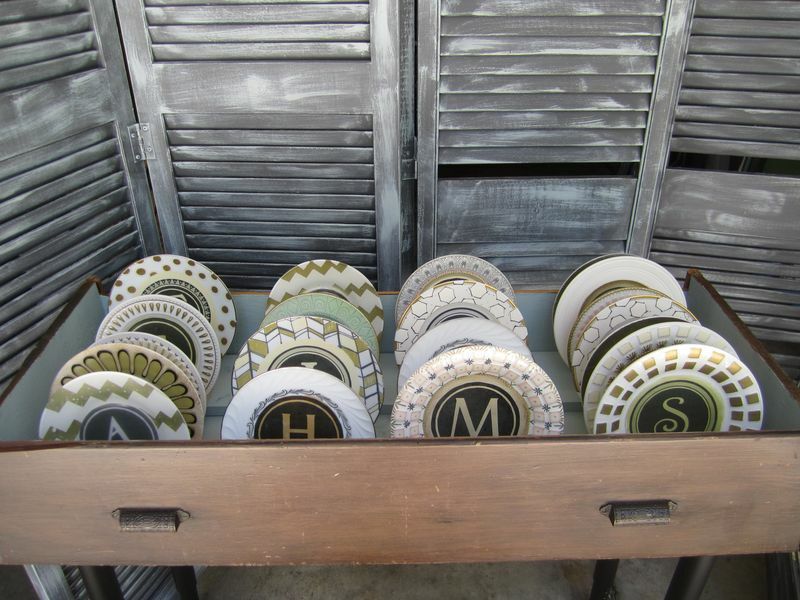 Upcycled monogram plates vary in size from 7 to 9 inches in diameter. 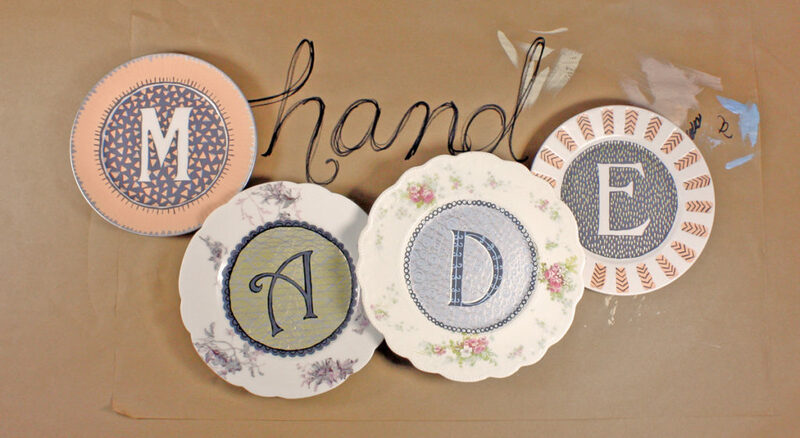 If you have specific letters in mind, I can paint a custom unique monogram in your choice of color scheme on a variety of thrift shop plates. Price is $24 without tax and shipping. 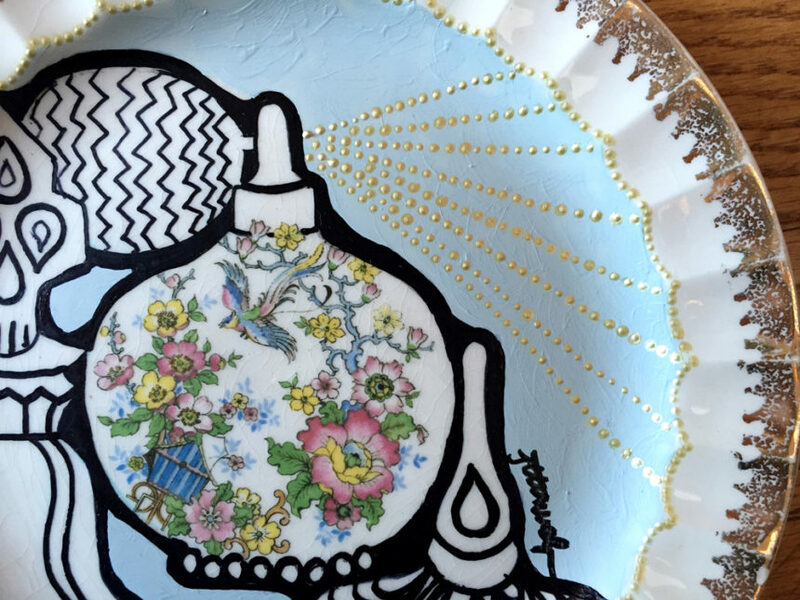 For more information on purchasing my original one-of-a-kind (OOAK) art, please contact me referencing monogram plates in your email. Note that these plates are for decoration only and come ready to hang. I’m starting my first official art show season this year. As a newbie, my booth display has been one of my biggest challenges. Many shows require a booth photo along with your art images during the jurying process. The lack of a good booth definitely hurt me in getting into some of the shows I wanted. My mother was a potter and I spent many of my high school years and beyond helping her at various art fairs across the country. Her booth setup was basically tables and crates. 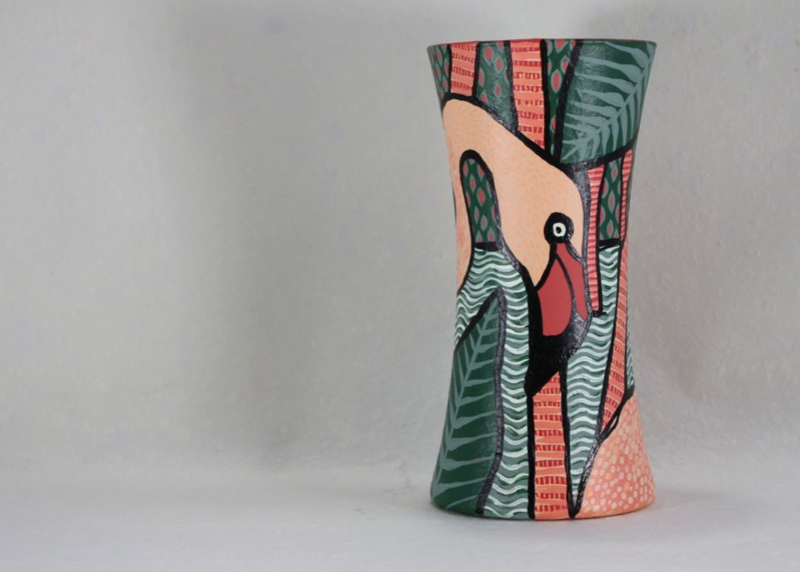 Her beautiful pottery was the focus. It seems that the quality of your booth design can have a bigger impact now compared to when she was selling her wares a number of years ago. So I asked for my parents’ expertise and energy to help me create a new booth. They are amazing! We whipped out the basic foundation of my booth in less than a week. In keeping with my “business plan” of upcycling, it seemed only appropriate I try to do the same with my display. 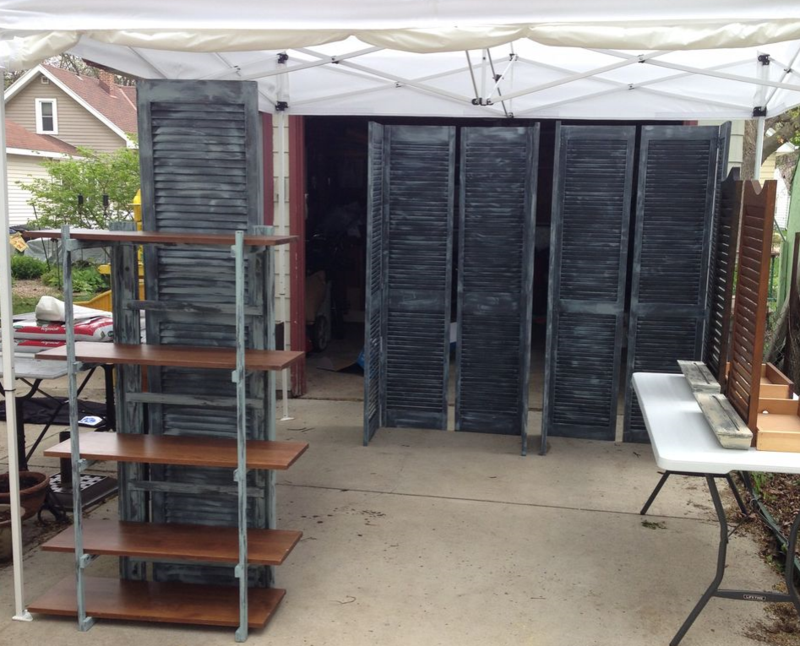 My parents found some great wood louver doors at Habitat for Humanity’s ReStore in Florida. We knocked out a few slats for shelves and painted them in charcoal and vintage green chalk paint. 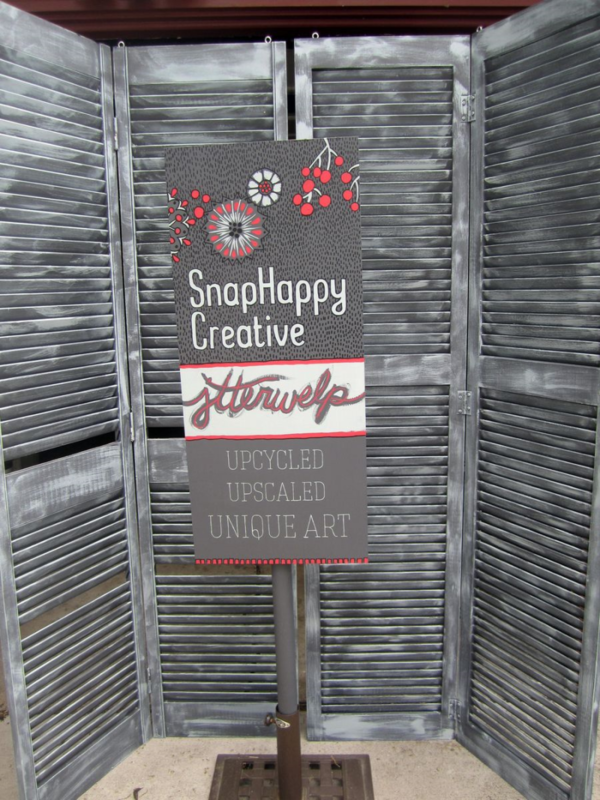 These will coordinate with my existing table display made from shutters we found at ReStore in Wauwatosa. I love ReStore! One of my first display finds was at Goodwill. 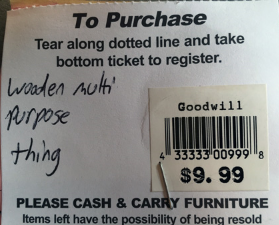 Despite the worker describing it as a “wooden multi purpose thing,” I knew exactly what it was and quickly snatched it. The shelving base didn’t come with shelves—but ReStore to the rescue. I found some great wood shelves that fit perfectly for $1 a piece. Did I mention I love ReStore?! I also figured out a better way to display my monogram plates using a wooden drawer (um, ReStore again) turned into a bin. We added metal legs on the bottom that can be removed for easier transporting. Crate and Barrel sells plate racks that fit nicely inside the drawer. I’m pleased with how this turned out. For the big finish, I created a sign from a wood shelf, PVC pipe, and a patio umbrella stand. I picked up the metal stand from a neighbor who was selling it on our city’s Buy, Sell, Trade and Freebies Facebook page. It makes a perfect heavy base for a sign. So, looks like I’m open for business! The robins are happily hopping around in my garden. For the first time in my life I witnessed a robin pull a worm from the ground. His feet planted firmly; he tugged and tugged. Finally, out popped a long, fat earthworm. Spring brightens our days and helps us recover from the dull winter. It’s the perfect time to get outside and discover new treasures to liven up your home. 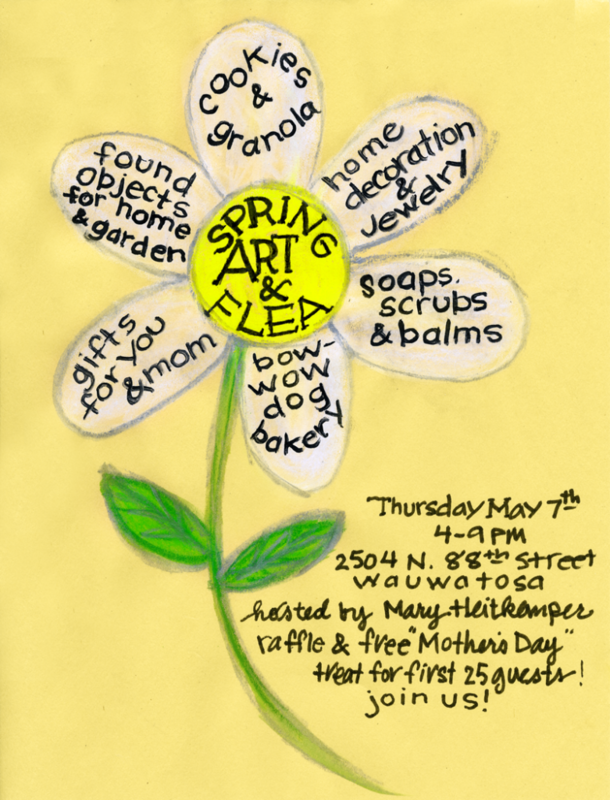 There will be many wonderful things to choose from at the Spring Art & Flea on May 7th. Mark your calendar and stop by for a hello from 4-9PM. Also, don’t forget about your mother. Mother’s Day is May 10. If you are a mother yourself, make sure your family knows they can pick out the perfect gift at our show. I have many new, delightful things. Recently, I have been experimenting with bottles and vases. Of course, birds are a strong influence. 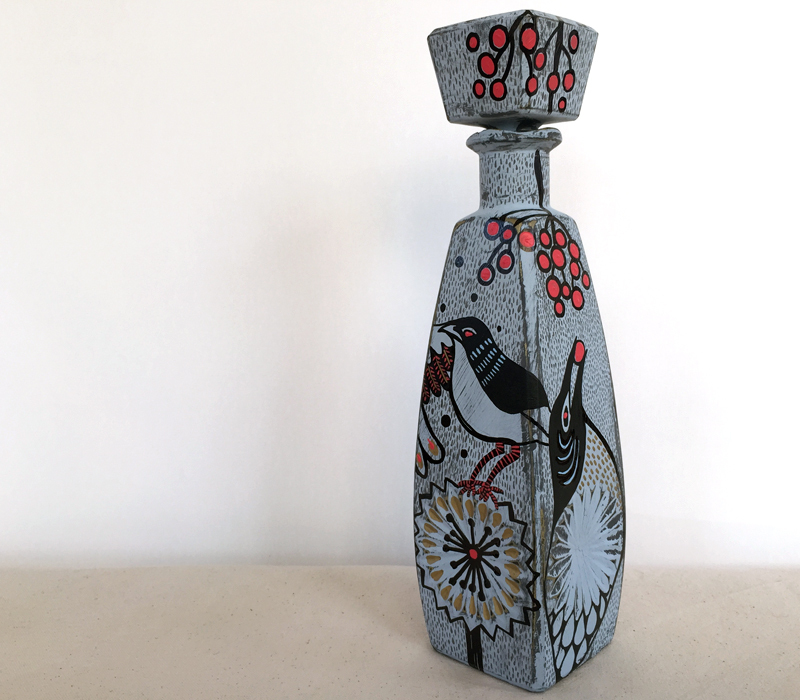 This four-sided bottle features black starlings that perch and fly through big, graphic flowers. Berries droop down, ready to be picked. 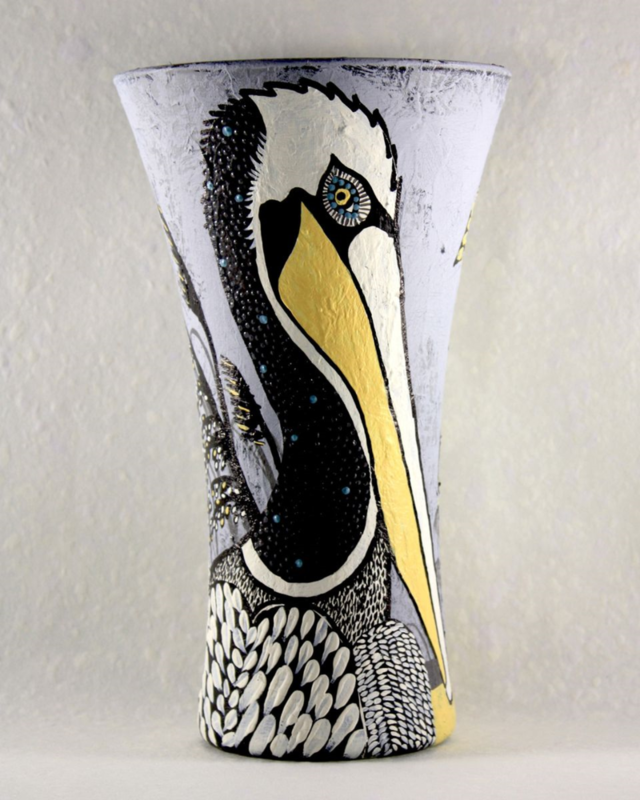 My design is original and hand-painted in black, soft blue, charcoal gray, lipstick red, and touches of gold. This upcycled bottle measures 11.5 inches in height. Price is $75 without tax and shipping. For more information on purchasing my original and one-of-a-kind (OOAK) art, please contact me referencing this bottle in your email. 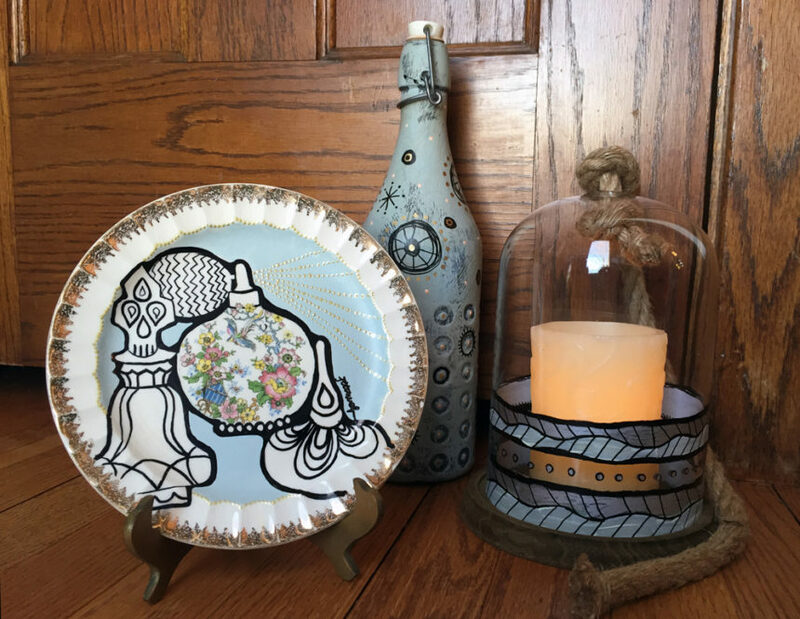 I can paint custom one-of-a-kind (OOAK) unique illustrations in your choice of color scheme on a variety of thrift shop glass and ceramic ware. Note that all my pieces are meant to be works of art and are for decoration only. When I started this project I was really going to keep things quiet. 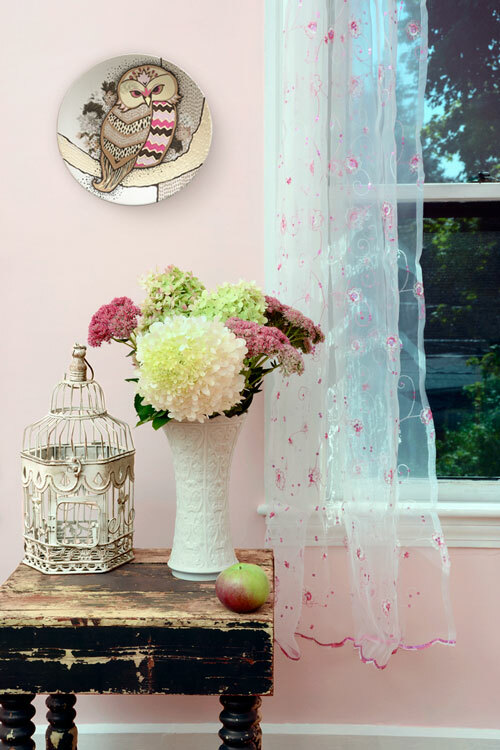 Muted and subdued colors that reflect the quiet beauty an owl portrays in the real world. But then I started painting. This owl had a mind of its own. It wanted to be a party animal. 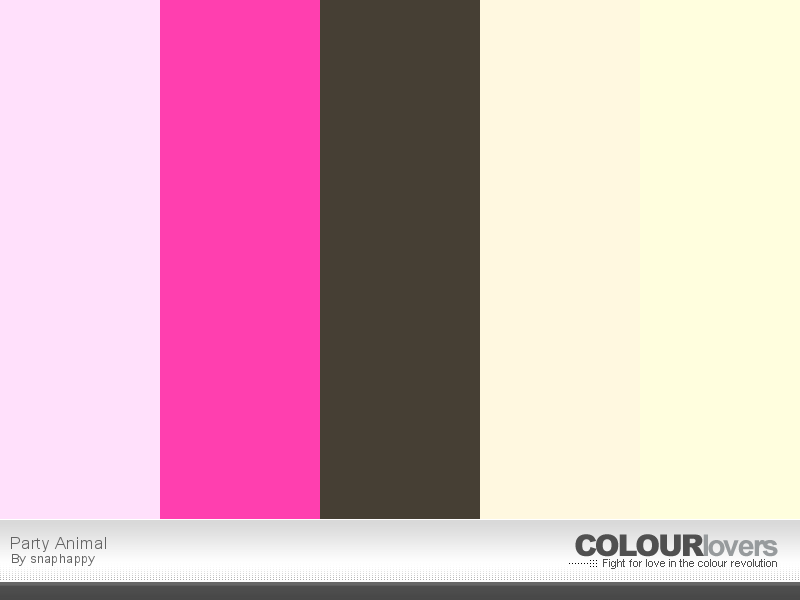 Taupes transformed into hot pink. Patterns became dynamic and strong. This owl didn’t want to sit back quietly—it wanted to pop! He really gives off quite a vibe and energy. Perfect for a place in your home that wants to be the center of attention. 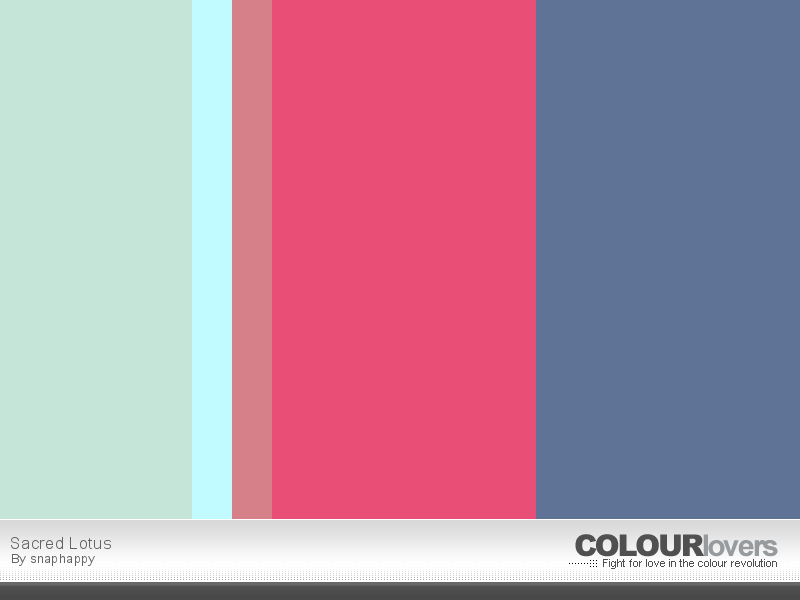 You can check out this color palette on COLOURLovers. 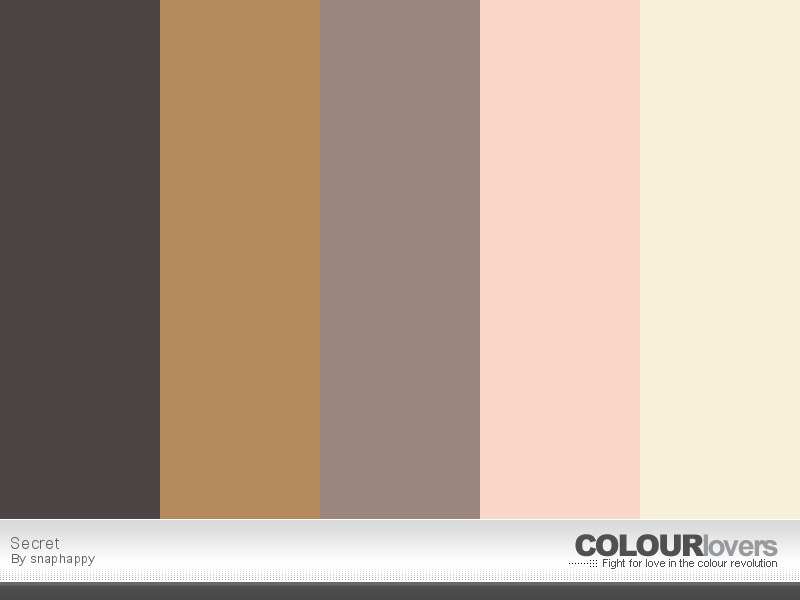 This is one of my favorite tools for creating color schemes. 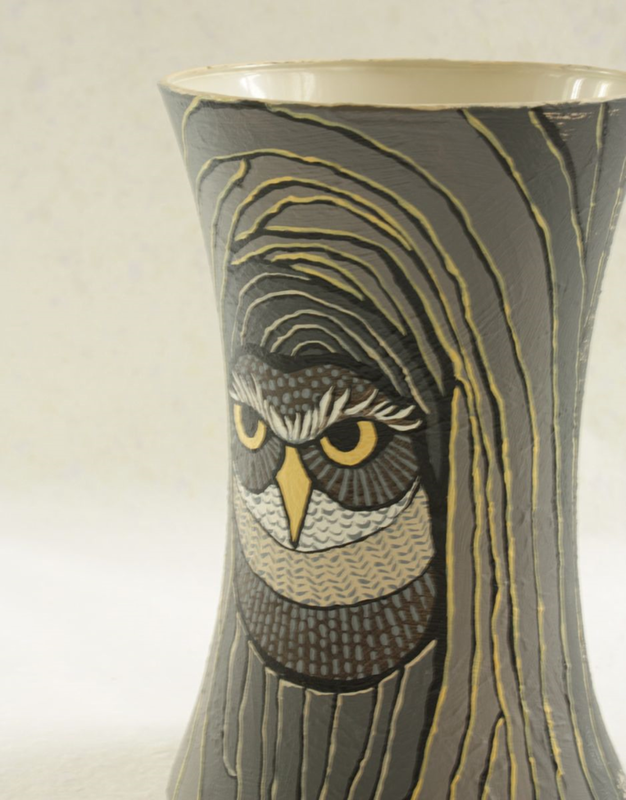 I may return again to the other color palette for another owl. It just depends on how he speaks to me when I start painting. 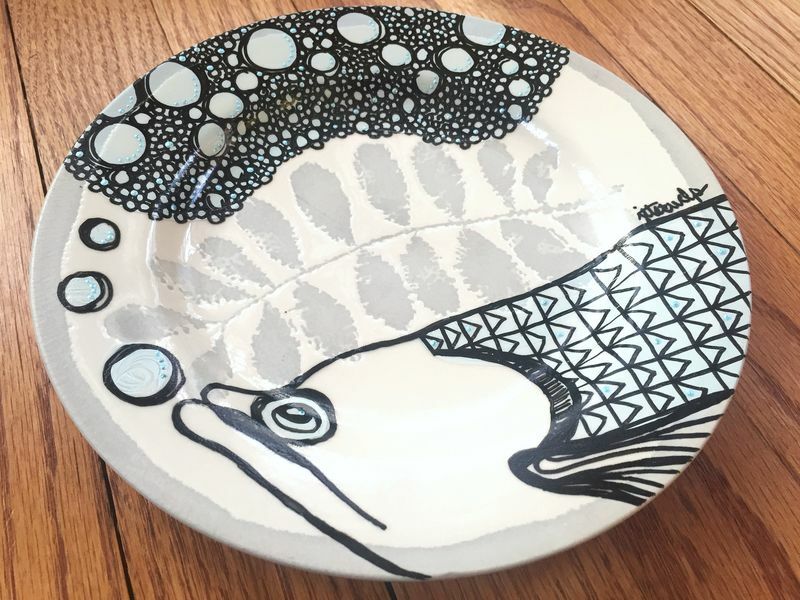 This upcycled plate measures 10.5 inches in diameter. Price is $40 without tax and shipping [SOLD]. 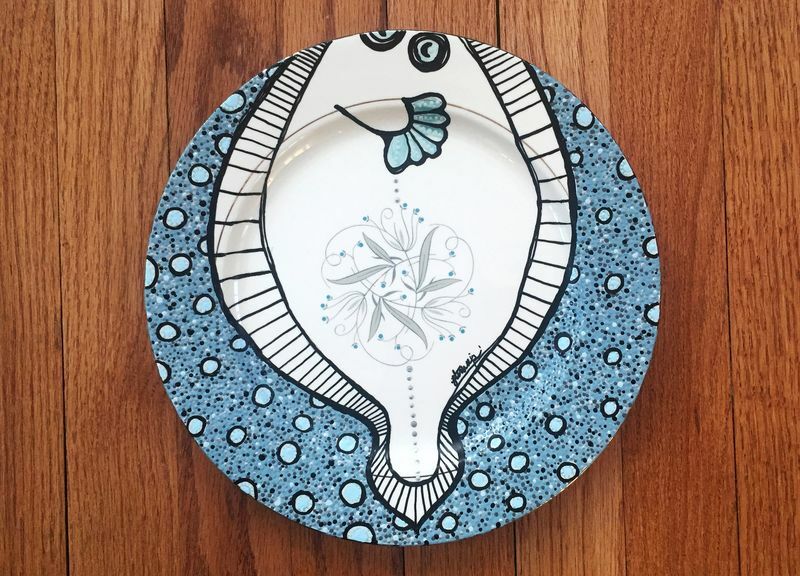 For more information on purchasing my original and one-of-a-kind (OOAK) art, please contact me referencing this plate in your email. 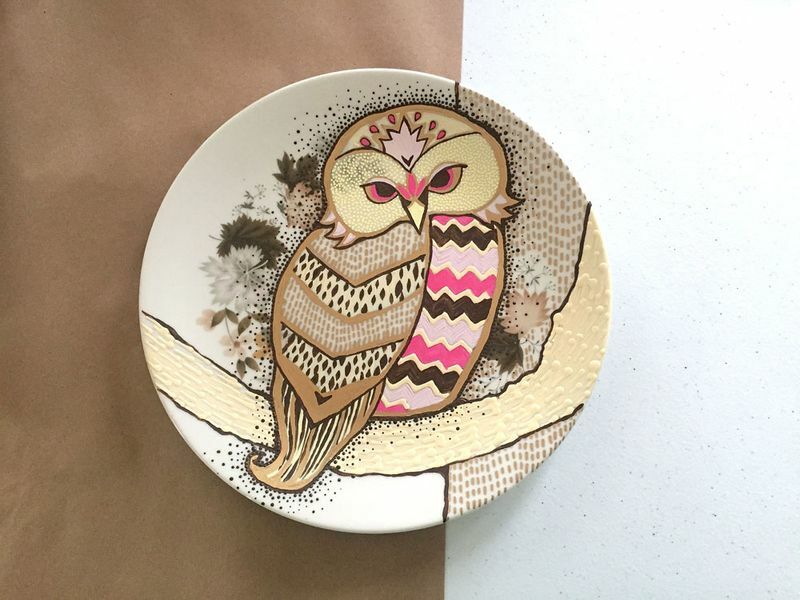 If you love owls, I can paint custom OOAK unique illustrations in your choice of color scheme on a variety of thrift shop tableware. Note that all my pieces are meant to be works of art and are for decoration only. Fish and sea life are such fascinating creatures for an artist to draw. They provide a lot of imaginative opportunities with shape, size, pattern, etc. And well, fish just have funny faces, don’t they? 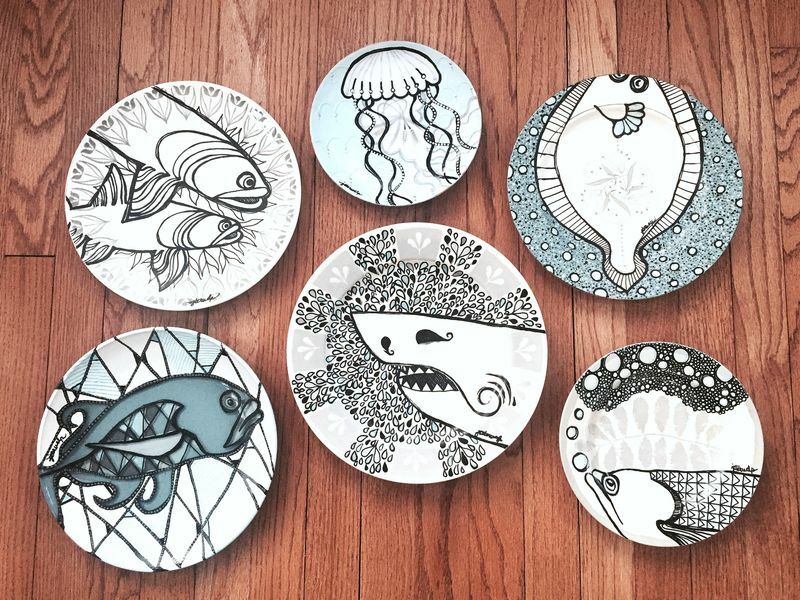 So I designed a set of sea life illustrations from a variety of cream, white, and gray plates I found. It won’t be the last of my undersea exploration I am sure. 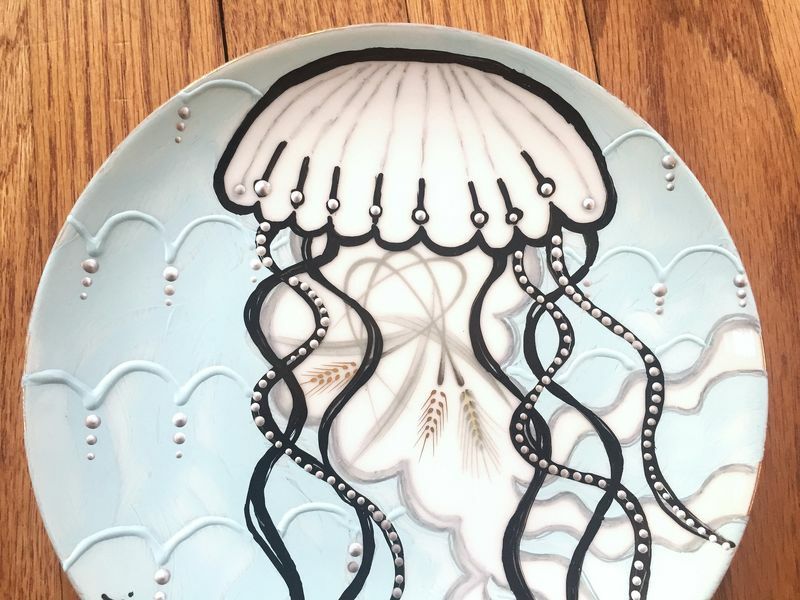 This small plate’s original design of looping leaves and grain reminded me of a jellyfish. The round arches form the body and the floral details become entwined with the tendrils as they float and curve down. The flounder is a distinctive and whimsical fish. This flounder waits on the bottom of a speckled, sandy sea floor while his wacky eyes dart right off the plate! This plate’s original gray leaf feature looks like seaweed to me. So I decided this fish needed a rest under seaweed and foamy bubbles. But fish can’t rest for long because there is a shark swimming about. Maybe that’s a school of small fish darting away? Or perhaps a big splash? No matter what — everything and everyone definitely wants to get away! This detail shows a technique I like to use. Because of the smooth surface of the plate, I can add texture and thinner lines by scratching the painted surface. The effect reminds me of block printing. This was originally a plain glass plate. Glass is fun to paint because of the layering you can achieve. 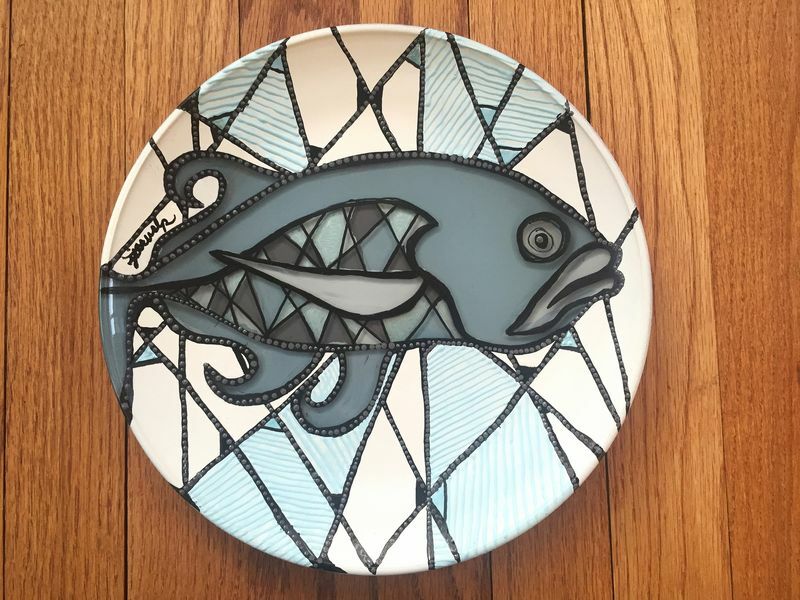 I first painted the color shapes of the fish on the back of the plate. On the front of the plate, I added the linear details and opaque background. I love the way this creates a dimension to the fish. I’m not exactly sure what kind of fish these were that inspired my drawing. I loved their big lips and open mouths. 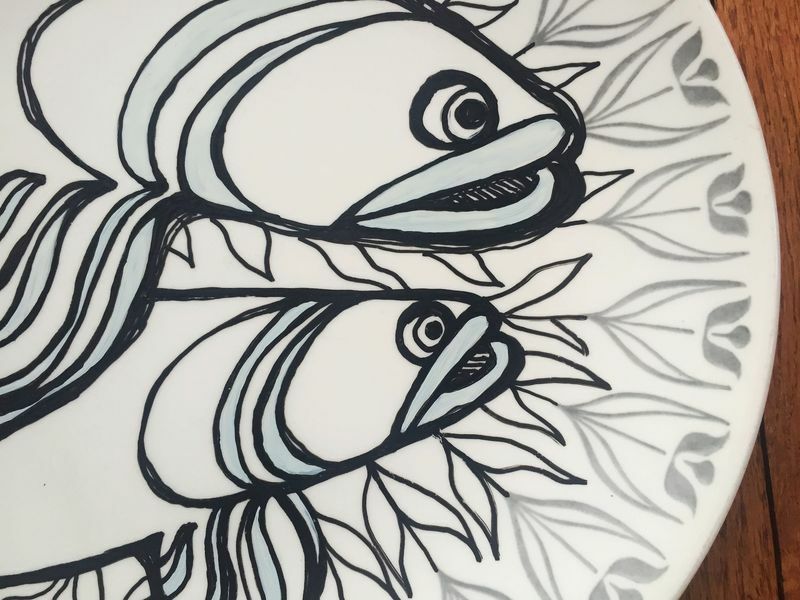 The existing floral design on the plate made a great “seaweed” background for this pair of swimming fish. These plates range in size of 7.5 to 11 inches. Prices are $25 to $40 [SOLD]. For more information on purchasing my original and one-of-a-kind art, please contact me referencing the plates on this post. 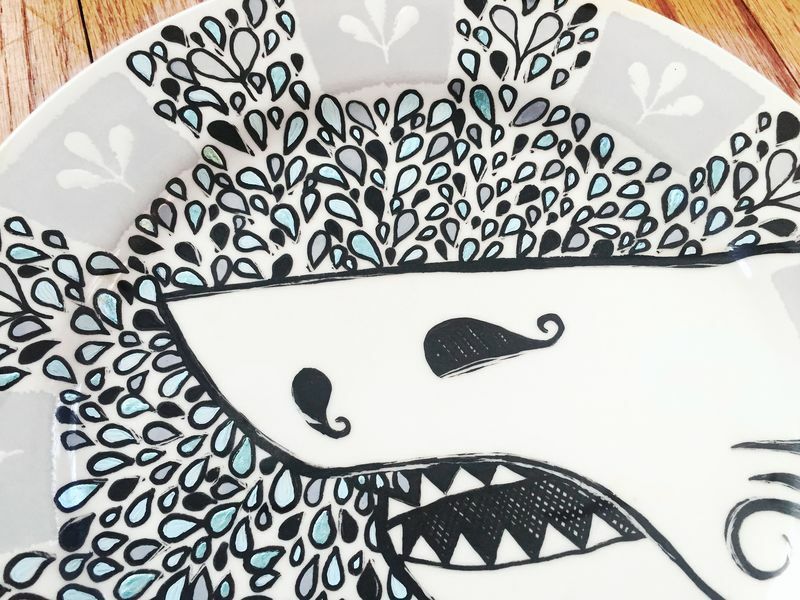 I can also create OOAK unique illustrations of your choice on a variety of thrift shop tableware. Note that all my pieces are meant to be works of art and are for decoration only. We are a few weeks into 2015. How many of you are sticking to your New Year resolutions? I’m really not the kind of person to make resolutions each year. I think I just don’t have the resolve. It’s a myth that it takes 21 days to form a new habit. It actually has been proven to average more like 66 days. And for some people it takes 254 days. I think I would be part of that group. That is, if I could not be distracted by another shiny object. 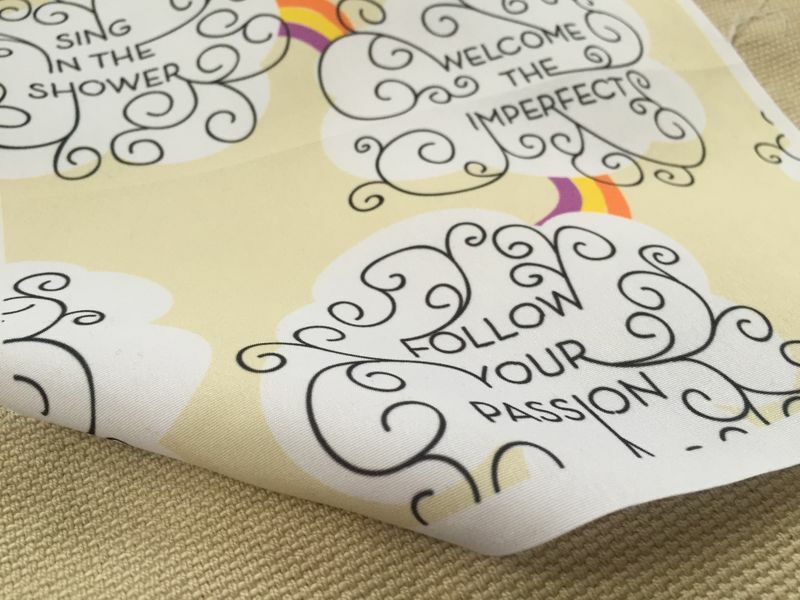 So I designed a fabric celebrating new year’s resolutions that are uplifting and fun. Forget that 20 pounds you want to lose. How about if you instead “radiate beauty inside and out?” I like that better. That’s a resolution that makes you feel good about yourself. Actually all 12 of my resolutions make you feel good about yourself. My “Resolutions” design can be purchased at my shop at Spoonflower. If you don’t sew, you can also purchase the design as gift wrap. Or even better, as wallpaper. You could wake up every day committed to happiness! The weather in Wisconsin is brutally cold. As a southern girl at heart, I just don’t adjust well to unthinkable temperatures like -22°F. I take my Vitamin D, turn on my “Happy” light, and try to turn my attention to things that warm my heart. Since I am feeling so blue, it is only appropriate I find myself painting with blue. But these blues don’t leave me in the cold. They lighten my spirits. Here’s a collection of my upcycled designs to make you happy when you are feeling so blue. 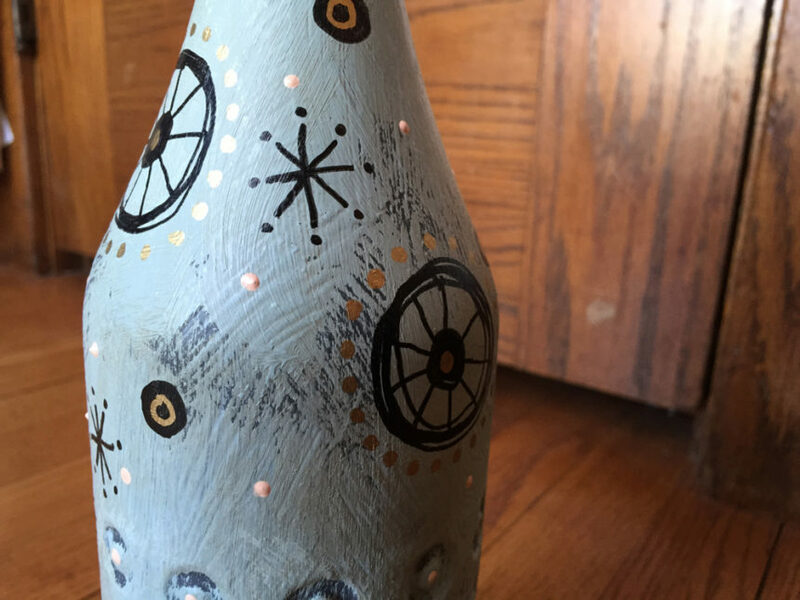 This detail of my bottle shows how I am enamored by texture and pattern. I love the whole process of slowly layering and scrubbing away; adding strong line and delicate dots; incorporating soft and shine. If you are like me and are shrouded in winter blues, I hope I have brought you a ray of sunshine and brightened your day. I’m working on a fabric collection called “Whale of a Time” for my shop on Spoonflower. 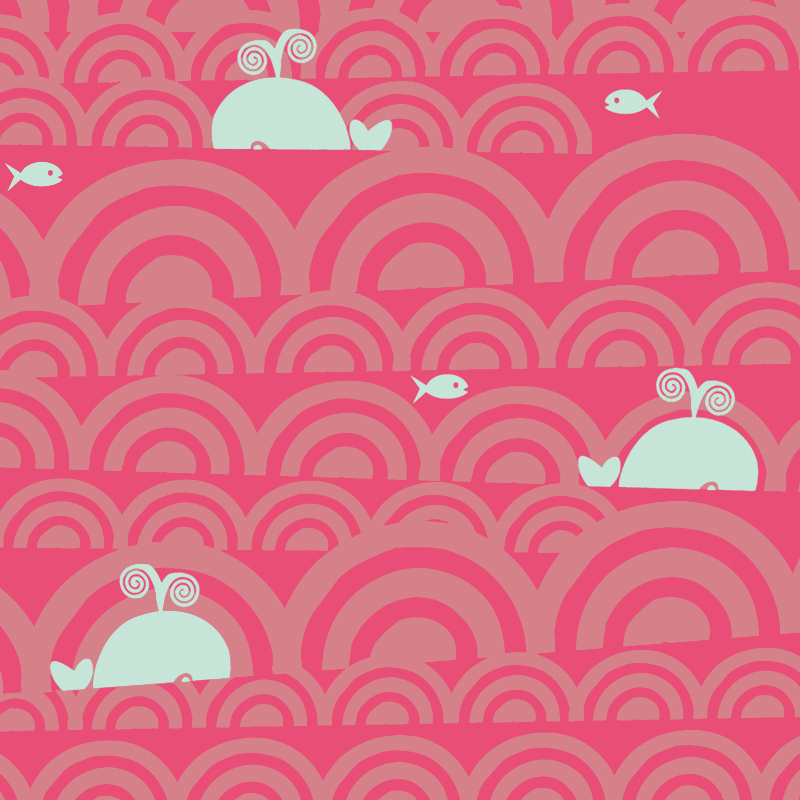 Spoonflower’s whale contest included a palette-limited colorway. The colors Spoonflower picked are more subtle than I usually work with, so I added some pop and created a new palette, Sacred Lotus, on COLOURLovers. I’m working on a new fabric design to submit to Spoonflower. 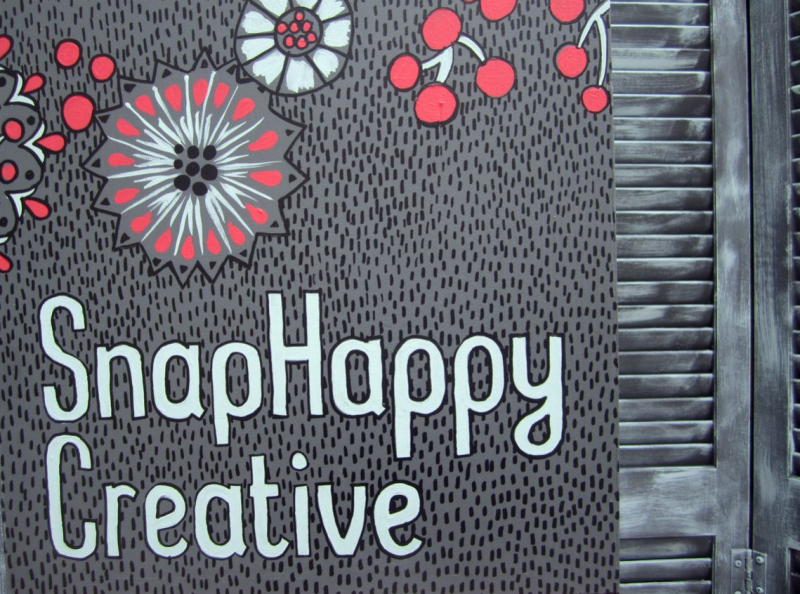 Spoonflower is one of my favorite sites that lets you create and sell custom-designed fabric. Here’s a close-up view of my submission to their Whale design competition.